Barracuda Studios is proud and excited to announce the first new decals since last year! 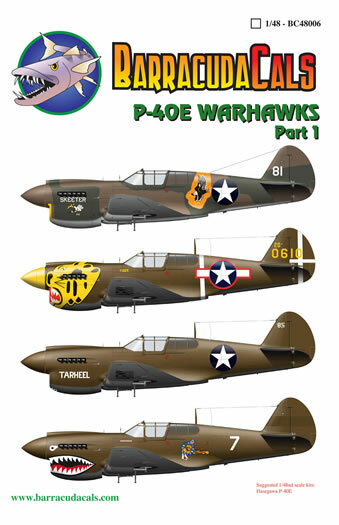 The very popular P-40 sheets that were released in 1/32nd scale have been reworked , reformatted and released in both 1/72 and 1/48th scales. This sheet has been expanded to include 2 new P-40B Tomahawks from the early days of 112 Squadron in North Africa. These 2 airplanes still carry the European camouflage with Medium Sea Grey codes, but sport the new sharkmouth motif that was first applied in Egypt. The other 3 schemes are carryovers from the 1/32nd sheet and feature the famous ace pilots Neville Duke and Clive R. Caldwell. GA-Y carries the very unusual and decidedly non-standard dark blue undersides. 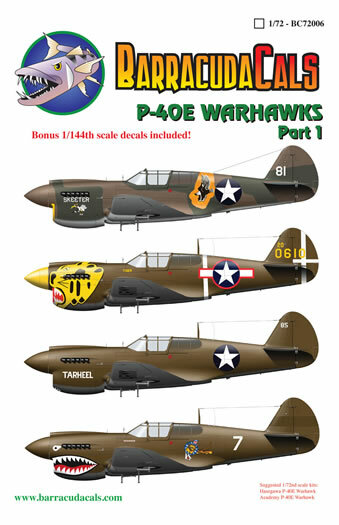 The Aleutian Tiger faced P-40 on this sheet is not the same one from the 1/32nd sheet. This one has never been done in decal form before, and is more colorful. It sports the red surrounded stars and bars as well as the white cross on the rudder and a nickname under the windscreen. Col. Bob Scott's Old Exterminator has never been done correctly in decal form, and Preddy's Tarheel, the aircraft he almost bought the farm in when a student pilot collided with him are also featured on the 1/32nd sheet, while John Lander's Skeeter is a new scheme. Despair not, oh builders of the one true scale! 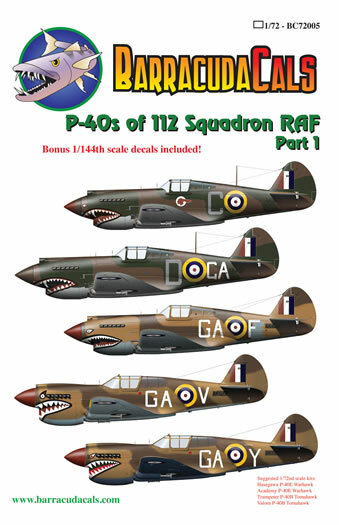 This sheet has been shrunk down to 1/72nd scale and expanded to include 2 new P-40B Tomahawks from the early days of 112 Squadron in North Africa. These 2 airplanes still carry the European camouflage with Medium Sea Grey codes, but sport the new sharkmouth motif that was first applied in Egypt. The other 3 schemes are carryovers from the 1/32nd sheet and feature the famous ace pilots Neville Duke and Clive R. Caldwell. GA-Y carries the very unusual and decidedly non-standard dark blue undersides. Here's another new sheet for the guys who can still see the really small stuff. The Aleutian Tiger faced P-40 on this sheet is not the same one from the 1/32nd sheet. This one has never been done in decal form before, and is more colorful. It sports the red surrounded stars and bars as well as the white cross on the rudder and a nickname under the windscreen. Col. Bob Scott's Old Exterminator has never been done correctly in decal form, and Preddy's Tarheel, the aircraft he almost bought the farm in when a student pilot collided with him are also featured on the 1/32nd sheet, while John Lander's Skeeter is a new scheme. These 4 sheets are printed and in house. The instructions arrived today, and a mad dash of packaging will ensue. These 4 new sheets will be debuted at the IPMS/USA National Convention in Phoenix, AZ (110 degrees plus Fahrenheit!!) starting this Thursday morning, August 5th. If you are attending the show, please stop by and say hello!